Woken up to my curiosity, I saw one of the newspapers lying open on my table carrying the picture of a leader being offered a gold crown by her admirers because the candidates to the Lok Sabha supported by her party had won! 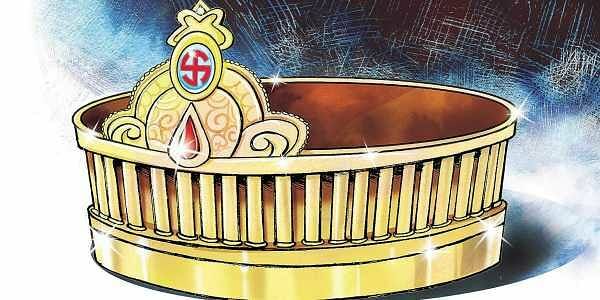 Now it ought to be for us to ask ourselves: Why a gold crown for one of the numerous mass leaders in the world’s largest democracy? The answer that would emerge from a crude layer of our collective subconscious is equally crude. We have abolished royalty and feudalism, but we yearn for them. The power we seek grows fascinating only with glamour—but a kind of glamour that wealth cannot craft, only an aura could—the aura once radiated by the royalty. Such a pursuit is illusory, but how many of our desires, our successes, our victories, are bereft of illusion? The aforesaid leader alone should not be blamed for this uncanny reality. For years after the abolition of the princedoms a vast part of our rural population, the tribal regions in particular, refused to believe that the Raja was no longer there. That the Raja could have been a despot was a different matter: how could there be Prajas without a Raja? How could there be a Rajya without a Raja? This was their simple logic. Of course, by and by they came to accept that their old good Raja had been vanquished in some invisible war yielding the throne to several new Rajas called mantris! I can never forget the pathetic case of an adherent to this conviction. The year was 1955. I was a student in Cuttack. A daring documentary maker, an ex-Army man and his collaborator Asit Mukherji, an ace artist of Odisha, roped me into their team as their script-writer and we drove into an almost inaccessible tribal hamlet ringed by hills. At night we found shelter in the “capital” of the erstwhile tiny feudatory state untouched by electricity, in a small bungalow that used to be the Raja’s guest house. In the morning, as we admired the timeworn tablecloth, a piece of velvet of rare quality, the old Chowkidar said, “Babu, won’t the new Raja ever return the dozen window and door screens his Rani took away, promising to wash them through experts and return? Our old Raja had just bought them from a foreign merchant. Years have passed. Busy as the Raja and Rani are, they forgot!” He referred to the first ministerial couple to have descended on the bungalow, post-merger. While the native Raj and the feudal traditions were only nostalgia for the common man, our power-seekers seem to have imbibed them into their ambitions, as reflected in the behaviour of their supporters. Reflect on the victory processions, feasts, riots of fireworks when a leader wins an election. The outbursts betray the same mood which a medieval Raja felt after crushing an enemy. Had ever a victor tried to put this much common sense into his court of fans that one’s victory was natural in a democracy and that it was a moment for him to meditate on the serious task awaiting him, that to be elected was a responsibility and not a fun or flattening a rival in a wrestling match? But the victors themselves carry this psychology of a wrestling match into the Assembly or the Parliament, though wrestling more with the exercise of their thoracic muscles. Scenes in our two sacred Houses in New Delhi are often a repetition of the Tower of Babel. The Babylonians were keen to build a tower to reach the heavens, but trying to outshout one another, each in a language of his own (symbolising his individual ego), they all collapsed and consequently collapsed the tower. Alas, one wonders at times if our democracy was not going to collapse. Again, the spirit these shouting and gesticulating expose is the same medieval spirit of fighting a bloody battle.“There will soon be only five monarchs left—the monarch of Britain and those on the cards—Diamonds, Hearts, Spades and Clubs,” said the last king of Egypt, Farouk 1. He has proved almost prophetic, but the ghost of monarchy often possesses the politicos and makes them ridiculous. In 1977, Jean-Bedel Bokassa, the President of the Central African Republic, changed the republic into an empire and, in the absence of any one prestigious enough to perform the indispensable ritual, he put the crown himself on his head amidst applause of those voted to uphold the republic! The crown tumbled in two years amidst a revolt.